Adkins began working with KID on the C-Flume replacement project in early 2013 starting with a structural assessment of the existing 92-year-old concrete structure. Adkins developed a list containing over 300 identified structural deficiencies. Approximately 40 deficiencies were categorized as severe requiring immediate remediation. As a temporary solution, Adkins designed structural repairs that could be salvaged and reused later by the District after the structure was demolished. Later in 2013, Adkins kicked-off the Preliminary Engineering Phase that required developing multiple viable alternatives and cost estimates. Since the existing structure was owned by the federal government (operated and maintained by KID), Adkins worked closely with the Bureau of Reclamation (USBR) to develop alternatives. Designs and estimates were reviewed by USBR’s Technical Service Center in Denver, CO. Alternatives considered included: replace as-is (elevated flume), extend earthen canals with shorter flume, buried siphon & elevated steel pipe, and extend earthen canals with buried siphon. Ultimately, KID and USBR opted to move forward with the buried siphon & elevated steel pipe option. Completing final design for the project required addressing several major constraints from a constructability standpoint. 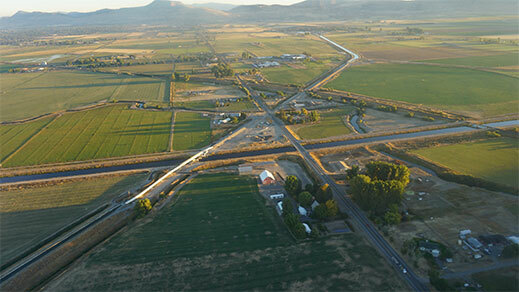 The project had to address – an active Union Pacific rail line crossing; crossing State Highway Route 39 (over 15,000 vehicles per day and major utility corridor); crossing the Lost River Diversion Canal (a manmade river diverting the Lost River to the Klamath River); and most critically, the existing structure had to maintain operations delivering water to over 20,000 acres of agricultural land in the Klamath Basin during irrigation season (May to October). 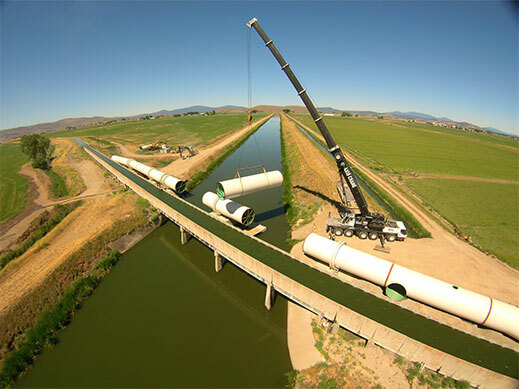 Adkins created a design that allowed for over 90% of the new siphon to be constructed during irrigation season without affecting operations of the existing flume structure. Adkins’ final cost estimate for construction of the project came in at $9.1M (vetted by a third party consultant from Portland, OR); over $5M lower than USBR’s original estimates of nearly $15M to replace the structure. 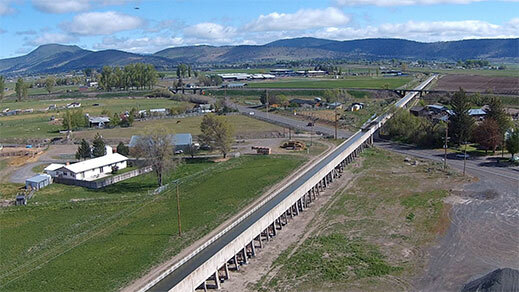 In August 2016, KID awarded a contract for $8.6M to construct the C-Flume replacement to R&G Excavating, Inc. located in Scio Oregon and ground was broken the next month. 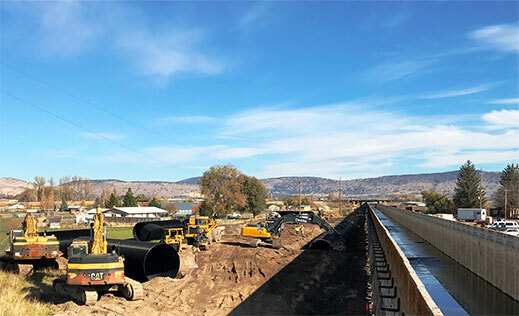 With construction lasting from September 2016 to fall/winter 2018, and project closeout projected for early 2019, Adkins has been working with KID for over 5-years to develop, implement, and complete the C-Flume replacement project. 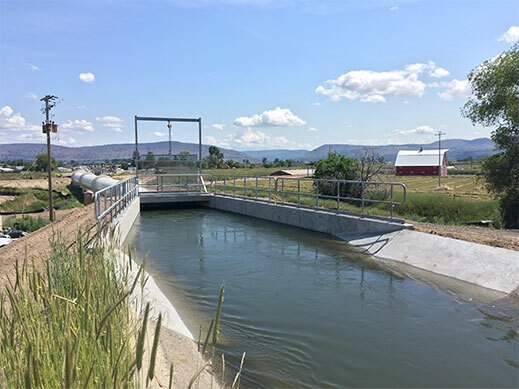 During this time, Adkins has provided a comprehensive suite of Professional Engineering, Surveying and Project Management services for Klamath Irrigation District. Adkins worked closely with local, state, and federal agencies including Klamath County, Oregon Department of Transportation, USBR, and Oregon Water Resources Department to obtain permits and authorizations as well as conduct public outreach in coordination with KID and USBR. Services: Surveying, Civil Engineering, Irrigation, Structural Engineering, Construction Management/Administration, Construction Materials Testing. 01. 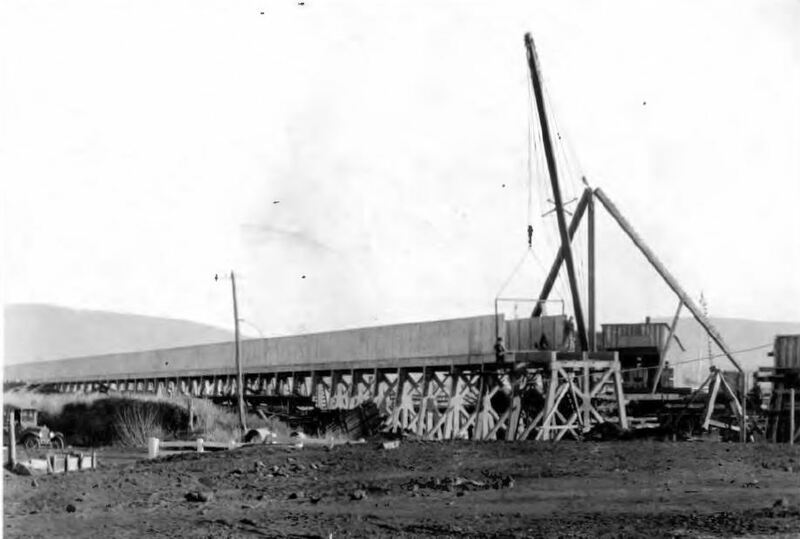 The original concrete flume during construction, circa 1928. An old automobile can be seen to the left on what was then The Dalles-California-Highway; today known as Klamath Falls-Malin Highway (OR Route 39). 02. Looking north-east the old flume crossed over Highway 39 and further in the distance under the BNSF railway. 03. Where feasible, the new siphon was constructed alongside the existing flume to ensure irrigation season would not be impacted by construction. 04. 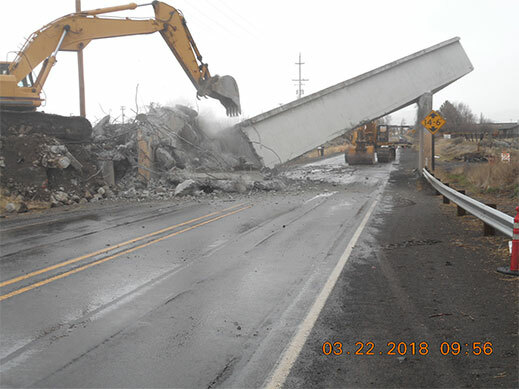 The final standing piece of the old flume crossing Highway 39 was demolished on March 22, 2018 under a full closure of the Highway. The bridge structure is estimated to have weighed over 100 tons. 5. 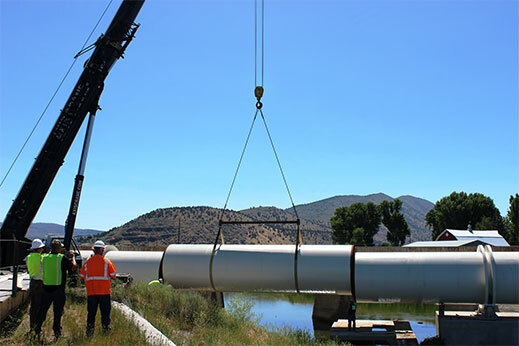 Axis crane placed 40-foot long sections of 10-foot diameter steel pipe to bridge the Lost River Diversion Canal (LRDC). 06. Setting the final pipe section bridging the LRDC. 08. The new C-Siphon outlet flowing during the 2018 irrigation season.